The Aspire landscape management system puts all your information in one place. Think about it: CRM, estimating, scheduling, purchasing, mobile time, invoicing, accounting and much more, all integrated. Aspire is cloud-based and designed for mobile, so information like contracts, client requests, scheduled services, purchases and billing is available in real-time and your data is managed in the Microsoft Cloud. 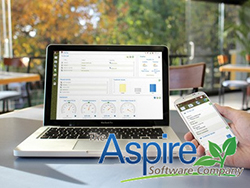 Aspire synchronizes with your Outlook or Google calendars and email allowing you to track every client touch. The reporting system provides business KPIs, sales pipeline, service and labor forecast, job cost, billing and receivables, and financials. For Aspire clients, deployment and training is as important as the software. An Aspire account manager “lives with you” during deployment. They set up your system and train your staff. Once deployed, you will use the AspireCare™ support system, where you can find answers online, talk to a live representative or compare notes with other Aspire users. What can you expect with the Aspire System? A fully-supported scalable system that will grow with you, staff that gets more done in a day and a 1-2 percent increase on your bottom line. Learn more at www.youraspire.com. To discuss if it’s right for your business, contact kevin.kehoe@youraspire.com.